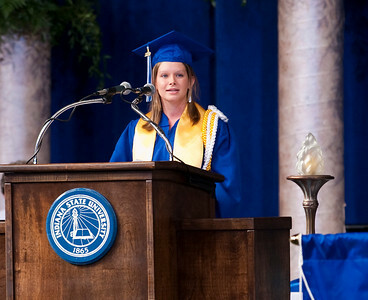 This is the prepared text of student commencement speaker Sadie Davis' address to the ISU class of 2009. President Bradley, Board of Trustees, faculty, staff, my fellow students, families and honored guests, I offer you a warm welcome and sincere pleasure at your attendance of this graduation ceremony. Mark Twain, an iconic American author and humorist, once commented, "It is better to give than to receive especially advice." Considering the truth in that, I will not offer advice to my fellow graduates today. Instead I invite you to use this time to reflect with me upon some advice we have already been given in our lives. Truly it is the wisdom of those who have come before us that has helped this great class of 2009 accomplish the next step in our lives. Granted, we do not always listen to the advice we get, but sometimes a small piece of knowledge and the experience that accompanies it will last a lifetime. Among the pieces of advice we have received, most of us have been told that a good pair of shoes, sturdily built and well cared for, will take us anywhere we need to go. For us, ISU has been and will continue to be that dependable pair of shoes, the foundation upon which we walk so proudly. At first, we may have had trouble finding the perfect fit; some of us have changed majors two, three or even four times. Just like breaking in a new pair of shoes, we may have struggled to break into our niche, but we finally made it, no matter how many years we have been working for this goal. Now, it is time to test our abilities and see where our feet can take us. Take a look around you. We are an incredibly diverse group with an amazing array of interests and talents. For some of us, dress shoes will ensure success, while others will meet challenges with loafers, sneakers or hiking boots. As I take a look at my closet, I can see a heap of shoes, and therefore a heap of positive and stimulating experiences that I have enjoyed because of ISU. This university has truly been with me every step of the way, and it is comforting to know that ISU will continue to be a driving force for us, pushing us forward to gain valuable new experiences in the future. Now back to that closet I mentioned. Take my pair of silver flip-flops for instance. Those flip-flops have survived four years of oppressively hot move-in days. They have braved roaring water in mid-June to retrieve a Frisbee that landed right in the center of the Fountain. My flip-flops have even taken me to San Jose, Costa Rica, where I studied Spanish through one of ISU's programs abroad. As my flip-flops demonstrate, I have learned to challenge myself on multiple levels at ISU. Another pair of shoes in my closet is my favorite pair of high heels. These shoes have gone to meetings with the Board of Trustees and clicked onto banquet halls, but they have also gone out dancing with friends and helped me through graduate school interviews. I wore them in Denver, Colo. at the Democratic National Convention, an opportunity that would not have been possible without the university's support and guidance. In other words, ISU has taught me to be versatile. A third pair of shoes is my trusty sneakers. These shoes that have come so close to falling apart have seen some of the most amazing day-to-day ISU experiences available. My sneakers have been kicked off in the library -- our campus living room -- and taken me to drink coffee with a new friend. They have watched me become engaged in an early morning conversation around a campfire with out honors director at the field campus and they have marched proudly beside my fellow students at Take Back the Night, our rally against domestic violence. These experiences remind me that ISU's greatest strength is its ability to link students, faculty and staff together in incredibly meaningful ways. More important than my personal gains, ISU has allowed me to walk a mile in another person's shoes along with others. I have participated in service learning events in Terre Haute and Chicago. My fellow students have rebuilt homes in Mississippi and served food to those in need. They have taught children English and raised money for hospital patients. Students at ISU truly understand how they can help their communities, whether they be local, national or global. We know that our degrees come with both praise and obligation, and I have no doubt that this class and many classes to come will do its part to improve the world. I am sure that my fellow graduates would tell similar stories. Their feet have been all over the world conducting research, going to Greek events, grabbing late night Taco Bell, and supporting our athletic teams. If we look back at our experiences, we will realize that we have walked miles and miles around this campus. The most amazing gift that ISU has given us is the chance to specialize and explore. We have become individuals. We have grown and developed here, and while our shoe sizes are probably still the same as they were during our freshmen year, there is a new confidence in our steps and an assurance in our chosen paths. Thank you to the people and groups that have made every day a day we can walk through with pride and strength. Thank you to our families and friends who have supported us in all of our pursuits. Thank you to the staff that set up the graduation stage and technology for today's ceremony and the administrative assistants that answered our calls and collected our timesheets. Thank you to the faculty that taught us and the administrators that looked out for our best interests. Thank you to ISU, our home and our haven. It is good to know that you've got our backs, and our feet. You are the trusty pair of shoes that lets us know that we can walk any path for any distance. We can become what we hope to be. ISU has given us all a chance to stride into successful futures, and I know that these shoes with last a lifetime. In closing, I offer you praise and the one piece of advice I will give today. Congratulations, class of 2009. Walk on.